Under this heading we will over time post recommendations to different interesting dive sites along the Tanzanian shore of Lake Tanganyika. First out is Frontosa Reef, an untouched underwater world in the deep where fish is in abundance. 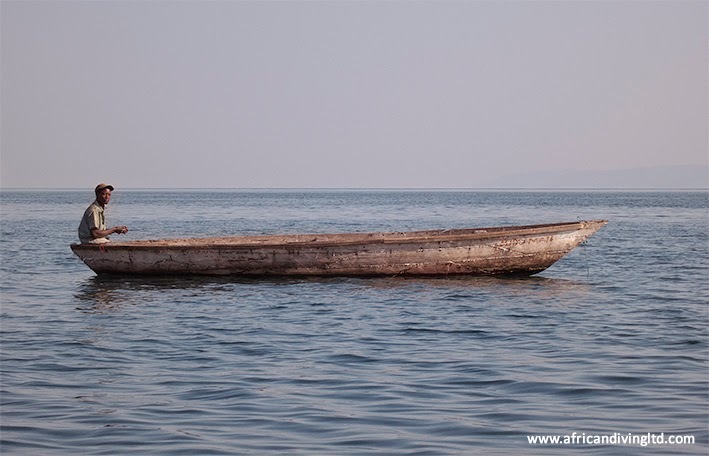 Located barley 4 km off Kolwe Point Cape Mpimbwe, Frontosa Reef offers one of the most amazing diving experiences in Lake Tanganyika. The submerged reef's shallowest depth is about 40 metres and it consists of huge boulders, some measuring up to more than 10 meters in diameter. In the deeper regions of the reef are dispersed open areas covered with thick layers of hard shell fragments. While the water is often crystal-clear, a strong current may occur from time to time, making some dives a bit of a challenge. Coordinates to Frontosa Reef: 7°06'38'' S, 30°27'44'' E (shallow point). Fig. 1. Fisherman fishing with line and hook off Cape Mpimbwe. Local fishermen from Msalaba, fishing for Cyphotilapia with line and hook, showed us the offshore location in July 1994. To find shallow points at the reef, a larger area was during a one week period scanned with eco-sounder. Though like finding a needle in a haystack, the task eventually resulted in the fact that we found several spots with depths around 40 m (one of the coordinates given above). The most common fish species found at the reef is Cyphotilapia gibberosa, a species which was not identified as a distinct species of its own until 2003 (Takahashi and Nakaya 2003). Earlier the fish at the reef was known as Cyphotilapia frontosa. C. gibberosa is very curious by nature and will readily approach a visitor. They occur at the reef in very large numbers, and among the boulders at 50 metres, individuals of more than 40 cm are occasionally seen. They tend to be solid blue. In the least deep areas, the first fish species one will encounter are Cyprichromis sp. “Mpimbwe zebra”, C. pavo, Neolamprologus sp. “Calliurus giant” and Lepidiolamprologus mimicus. In appearance and behaviour, C. sp. 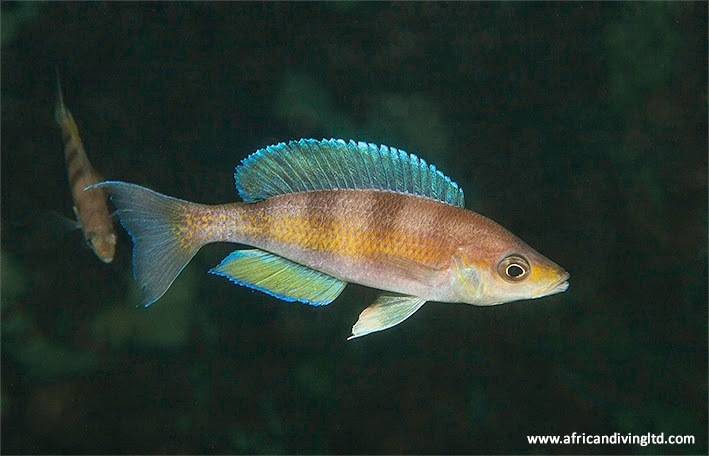 “Mpimbwe zebra” is similar to C. zonatus from Zambian waters. The latter was prior to formal description known as C. sp. “Zebra” (Takahashi et al. 2002; Konings 2003). The two species may be closely related, and interjacent similar populations along the coast have been discovered (pers. obs.). Both males and females ofC. sp. “Mpimbwe zebra” are nicely coloured; males orange and females yellow. Fig. 2. Cyprichromis sp. "Mpimbwe zebra" at Frontosa Reef", depth 45 m.
Neolamprologus sp. “Calliurus giant” may be synonymous with N. calliurus, which in turn is synonymous with N. brevis, at least according to Poll (1986) and according to several scientific studies and field observations, e. g. Ota et al. (2012). However, N. sp. “Calliurus giant” appears and behaves differently than the ‘ordinary’ N. calliurus (syn. N. brevis). At the reef, no members of the N. savoryi species complex (Verburg and Bills 2007) seems to have been established (pers. obs. ), and the niche which at other places normally is occupied by some of the members in this complex, is here at Frontosa Reef instead inhabited by N. sp. “Calliurus giant”. They exist in great numbers. A strikingly orange spot adorns their head. Both males and females are known to grow relatively large, commonly 11 and 9 cm respectively. They do not breed in empty shells, but in crevices and openings in the rocky habitat; and they normally dwell in the open water collecting plankton, sometimes in large schools. This behaviour is very similar to most members of the N. savoryi species complex elsewhere. Fig. 3. Neolamprologus sp. "Calliurus giant" at Frontosa Reef. Open areas with scattered medium sized rocks are found in certain deeper areas. In these areas Julidochromis regani is common. The variant found here is one of the largest in the lake. In the same habitat lives an unidentified species of Telmatochromis, as well as (what seems to be) the delicate Xenotilapia nasus. Beneath boulders in the deeper regions of 50 metres or more, one of the lake’s less commonly known fish species can be found. This is Trematochromis benthicola (syn. Trematochromis schreyeni (Takahashi et al. 2006), Ctenochromis benthicola (Geerts 2006)). It is a timid species and spends much of its day-time hiding in the rocky environment. On rare occasions, deep orange mutant coloured individuals can be spotted. Such colour variation by this species is known to occur elsewhere in the lake as well, and has been reported from Uvira and Pemba, in the northern part of the lake (Poll 1979). Further on, exceptionally large individuals of Benthochromis tricoti are found hovering over the boulders. Even though we recommend anybody to dive the reef we do recommend a certain level of dive experience before venturing the dive site. For navigation purposes in the rocky maze, a hand held dive reel or a bright beacon attached to an ascending line is recommended in order to practise a safe dive and secure ascent. At the given coordinates is a shallow point of 40 m. The depth is measured from the top of a group of boulders and it gets abruptly deeper when getting off the boulders. If inexperienced it is recommended to stay at the boulders within reach of the descending line and from there enjoy the spectacle of nature. Because of the offshore locality and deep water nature, there are no hippos, crocodiles or water cobras at the reef so you don’t have to watch your back but could enjoy the dive to the fullest. High standard accommodation is available at Kipili, 40 km south of the reef with three different options; the stunning Lupita Island Resort (exclusive), the universally praised Lake Shore Lodge (PADI-certified diving operations) and the lakeside guesthouse St. Benedict Mission (budget). At Karema, 30 km north of the reef, Julieta Guesthouse (budget) is located on the beach side of town. In addition to this, several suitable campsites are available at nearby Cape Mpimbwe. Geerts, M. (2006) Cichlidesque. Actualiteiten en Wetenswaardigheden. Verwikkelingen rond Trematochromis schreyeni. Cichlidae - Journal of the Dutch and Belgian Cichlid Associations, 32 (4): 99-100. Konings, A. (2003) New Cyprichromis from Zambia. Cichlid News, 12 (2): 6-15. Aquatic Promotions Division, Miami, FL. 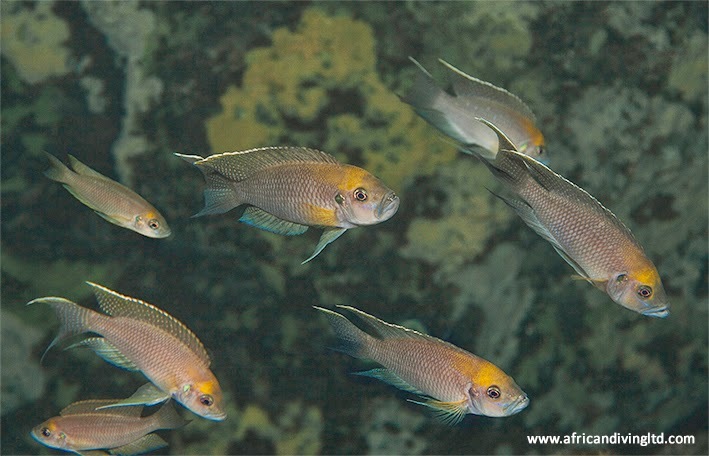 Ota, K., Aibara, M., Morita, M., Awata, S., Hori, M. and Kohda, M. (2012) Alternative reproductive tactics in the shell-brooding Lake Tanganyika cichlid Neolamprologus brevis. International Journal of Evolutionary Biology, 2012 (915265): 10 pp. Poll, M. (1979) Un Haplochromis rouge du lac Tanganika, femelle de H. benthicola Matthes, 1962 (Pisces, Cichlidae). Revue de Zoologie Africaine, 93 (2): 467-475. Poll, M. (1986) Classification des Cichlidae du lac Tanganika. Tribus, genres et espèces. Académie Royale de Belgique, Mémoires de la Classe des Sciences, Collection in 8°, (2), 45 (2): 1-163. 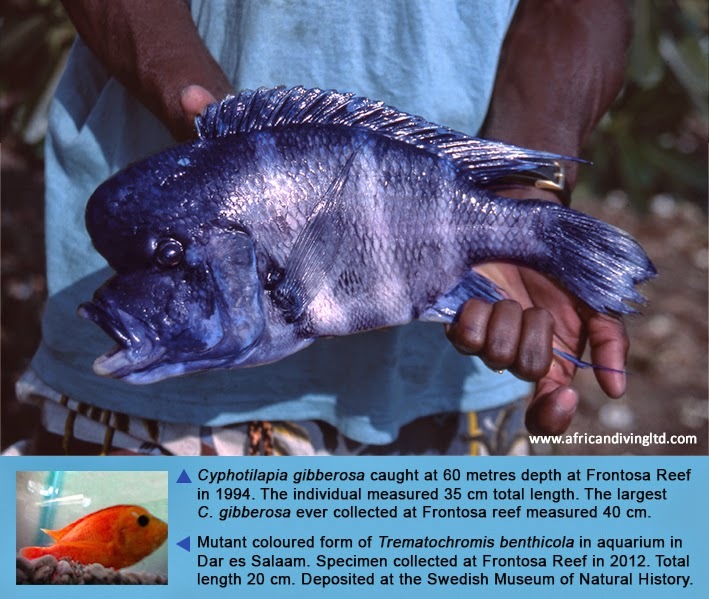 Takahashi, T. and Nakaya, K. (2003) New species of Cyphotilapia (Perciformes: Cichlidae) from Lake Tanganyika, Africa. Copeia, 2003 (4): 824-832. Takahashi, T., Hori, M. and Nakaya, K. (2002) New species of Cyprichromis (Perciformes: Cichlidae) from Lake Tanganyika, Africa. Copeia, 2002 (4): 1029-1036. Takahashi, T., Snoeks, J. and Nakaya, K. (2006) Trematochromis schreyeni Poll, 1987, a junior synonym of 'Ctenochromis' benthicola (Matthes, 1962) (Perciformes: Cichlidae) from Lake Tanganyika. Journal of Fish Biology, 68 (A): 56-67.